metallic sparkling, gold-coloured, not magnetic! Silly Putty impresses with cool tricks and fascinating effects. You can shape it, knead it, pull it, rip it, or let it bounce. Additional feature of the model "Metallic": it looks like molten metal that dissolves in the hand! Available in 3 colours: Gold Rush, Copper Glance and Platinum. The magic putty comes in a practical metal container. "Goldrush" with its golden metallic effect sparkles in the light and is an absolute eye-catcher. Where else can you get your own nugget of gold? "Platinum" impresses with bright, radiant metal gloss that immediately fascinates. "Copper Glance" impresses with its copper-coloured swirl. 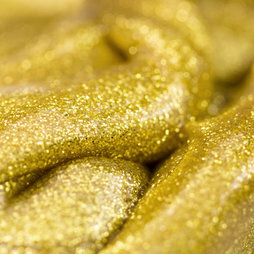 The surprising glitter of this metallic putty excites young and old!